The Sheraton Columbia Town Center Hotel will soon undergo $20 million in renovations to bring the property up to par with the four-star standards of its new Marriott Autograph flag. Owner and developer Costello Construction will add 70 rooms, bringing the total to 290, and update the entire interior and exterior of the hotel that sits on Lake Kittamaqundi at 10207 Wincopin Cir. The focus will be on creating a "high quality" and "luxury" product, Costello Construction President David Costello said. Costello and architect on the project, Design Collective, presented plans for the redesign to Howard County's Design Advisory Panel Wednesday night. 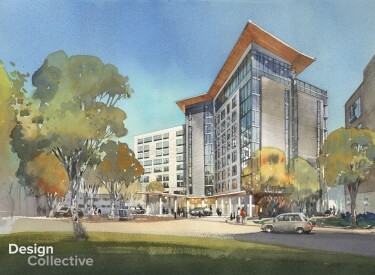 Renderings and concept images show a modern hotel that incorporates warm materials like wood, stone and blackened steel, leather furniture and dark accents, large glass windows and trendy lighting. The hotel's revamp comes amid larger plans by Columbia developer Howard Hughes to redevelop the area around Lakefront into more of an urban setting with new office, retail and residential, including condominiums for the first time in the area. Howard Hughes' $5 billion plan extends to other parts of downtown Columbia and will take 30 years to complete. Costello Construction purchased the 10-story hotel as IMH Columbia LLC in December 2017 for $22.5 million, state property records show. Costello said the company is financing the renovation. He initially told the Baltimore Business Journal that the revamp would get underway mid-2018 and cost half of what he is now projecting. Costello said it took longer than expected to complete designs for the project, which include "substantial" changes driven by his desire for the hotel to carry Marriott's luxury Autograph Collection flag. The hotel brand has only one other location in Maryland, the Annapolis Waterfront Hotel, and one in Washington, D.C., the Mayflower Hotel. The four-star brand has high standards, Costello said, so the building's HVAC systems will need to be updated and all bathrooms and flooring in the hotel will also be redone. The atrium will also be completely redesigned, and other common areas and amenity spaces will be added or updated like a fitness center, dining and bar areas, outdoor fire pits, a rooftop pool, meeting and conference areas and possibly a spa. The hotel's entryway will also change. Costello said it is "almost a complete reconstruction of the property." Part of the redesign is the construction of two additions on the south side of the hotel that will add 5,500 square feet to each floor. The additions will provide more space for the added rooms, and expanded amenities and meeting rooms. The additions will take 12 to 14 months to complete Costello said, with another six to eight months to wrap up the interior work. Costello said a renovation of the hotel that opened in the early 1980s is "long overdue." He hopes that the refreshed property will "help change Lakefront" noting the recent exodus of companies from the area, including the now-vacant American Cities Building and former Copeland's restaurant, both of which are slated for demolition by Howard Hughes. MedStar Health also once had a presence near Lakefront at 5565 Sterrett Place, before moving to the new One Merriweather office tower by Howard Hughes just a mile away. A relatively new restaurant at Lakefront by Foreman Wolf called Lupa also recently shuttered, citing disinterest from investors. 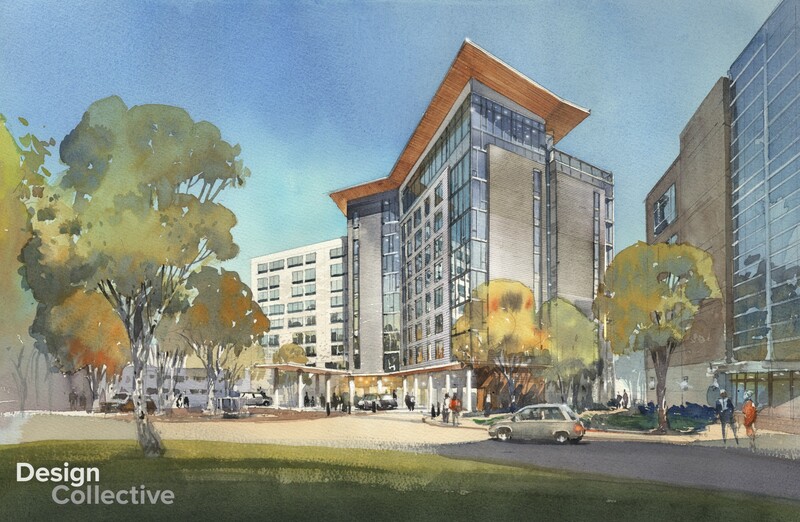 Costello's revamped Lakefront hotel will in some ways be in competition with a recently proposed 208-room hotel by Howard Hughes at its planned Merriweather District. Costello said he is focused on making his hotel "exceptional" and believes they will be successful by providing a "high quality product." He mentioned the success his company had with its Little Patuxent Square mixed-use development, which is located near the Lakefront hotel. "I think we really built a quality product and its been proven that there is an appetite for high quality products in Columbia," Costello said. "We put a ton of thought and energy into making that hotel be the best it can be."